Why should I buy a Family Seat? Family Seat is a British company and creators of the Original All-In-One Georgia Family Toilet Seat and the Talia Soft Close Family Toilet Seat. We have been manufacturing the Family Seat since 2003 and pride ourselves on the fact that thousands of children have successfully been potty trained using our all-in-one seats. Don’t Let Potty Training Send You Potty! 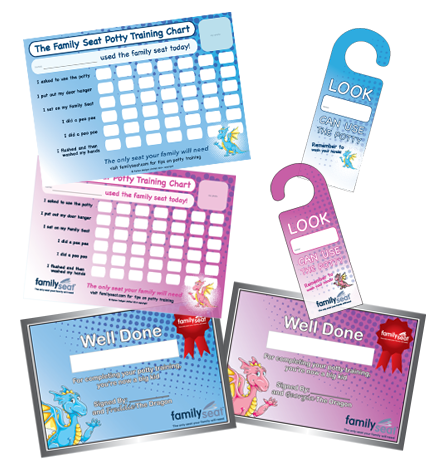 Whether you are potty training girls or potty training boys, Family Seat supply a Potty Training Help Guide and a range of potty training help tools to assist you. Our products, brands, domain names and literature (including websites) are protected by intellectual property rights including design registrations and rights, trademark and domain name registrations and copyrights, in many countries worldwide. All intellectual property rights are owned by Rymax Designs Limited and used exclusively by Family Seat Limited under licence. © Rymax Designs Limited 2015. All rights reserved. VAT Number 799 3436 66. Site by Philp eCommerce.